We’d love your help. Let us know what’s wrong with this preview of Hilda FCBD by Luke Pearson. 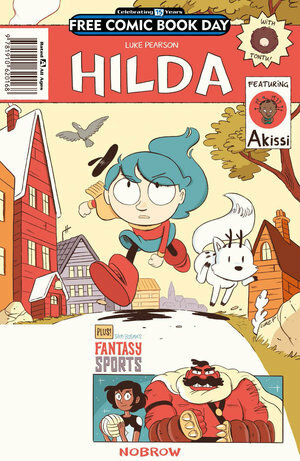 To ask other readers questions about Hilda FCBD, please sign up. HILDA: "I don't have a problem with a pie that's too full." TONTU: "Would you lament a life too full of happiness?" It's cute and child-f HILDA: "I don't have a problem with a pie that's too full." It's cute and child-friendly, appropriate for all ages. It reminds me a bit of Gravity Falls or something. There's also a teaser for Akissi by Abouet Sapin, which takes place in Africa and also features children. While I enjoyed reading a comic in which everyone was black, the plot was boring and the art was terrible. I got this on Free Comic Book Day 2016 and I thought it was really fun! Twig is especially adorable. I was a little lost with what was going on. Is it all in Hilda's imagination? Maybe only certain people can see these creatures? There wasn't much introduction or explanation, but it didn't take away from the fun spunky character Hilda and her fun adventures. I enjoyed it and will check out the next entry for sure! Thanks for making this a free comic so I was able to find it easily on my first tri I got this on Free Comic Book Day 2016 and I thought it was really fun! Twig is especially adorable. I was a little lost with what was going on. Is it all in Hilda's imagination? Maybe only certain people can see these creatures? There wasn't much introduction or explanation, but it didn't take away from the fun spunky character Hilda and her fun adventures. I enjoyed it and will check out the next entry for sure! Thanks for making this a free comic so I was able to find it easily on my first trip to the comic book store! Loved the whimsy of the Hilda story, but I was confused about what the context was for the story. Akissi was unique, fantasy sports was too short. Really enjoyed the Hilda section! I fell in love with Hilda and Twig. I quite liked Akissi. Didn't get on with fantasy Sports at all.